Obesity has assumed epidemic proportions in many countries in the world. In the United States, two-thirds of adults are overweight, one-half of whom are obese. Obesity is the leading preventable cause of death worldwide and has been strongly linked to such diseases as type 2 diabetes and heart disease. In 1962, James Neel, a prominent research medical geneticist at the University of Michigan Medical School, proposed the thrifty gene hypothesis, which sought to explain the tendency of certain ethnic groups (such as Native Americans) to have obesity and diabetes. With additional evidence about mechanisms underlying diabetes, the differentiation between type 1 (insulin-dependent) and type 2 (non-insulin dependent) diabetes, and alternate theories about factors leading to obesity, Neel revised his original thrifty gene hypothesis in 1998 to be more general, and not diabetes-specific. Fat was not always viewed negatively; in fact, it was perceived to confer certain advantages, including serving as a depot for the long-term storage of energy. Throughout much of human history, famine, unfavorable climatic conditions, or the absence of prey made the supply of food for the hunter-gatherer problematic. Humans evolved complex physiological and genetic systems (such as Neel’s thrifty gene) to protect against starvation and preserve body fat. In addition, body fat keeps individuals warmer in the cold, both by serving as insulation and by emitting heat when burned. Such a situation would have been beneficial when early humans left the warm climes of Africa and migrated to colder climates—in particular, northern Europe. Fat also provides physical protection, as is seen in pregnant women, who add layers of fat to keep their fetus warm and protected. The thrifty gene theory has been subject to challenge. In particular, scientists have been unable to find proof or even evidence for its existence. In its stead, simple, commonsense explanations for obesity have been offered: over the past century, energy-saving devices have largely reduced the need for heavy manual labor. Virtually all experts agree that the contemporary prevalence of obesity is the result of our relative lack of physical activity and the abundance and consumption of attractive, unhealthy food choices. SEE ALSO: Leptin: The Thinness Hormone (1994). 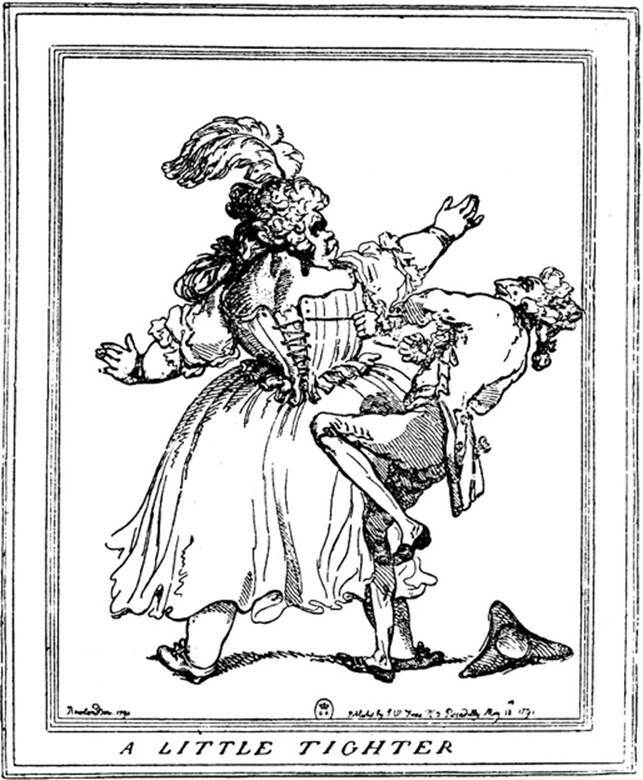 During the eighteenth and nineteenth centuries, waist cincher corsets, as shown in this 1791 cartoon by English caricaturist Thomas Rowlandson (1756–1827), helped women attain the then-desired waist measurement of 19 inches (48 centimeters).